Imagine this: Your company is routinely developing blockbuster products for markets it has never supplied before. For this to happen, you’ll need to change your thinking. First, stop thinking of these as “new” markets. Second, stop thinking of uncertainty as something to fear. That market isn’t really “new”: You may have noticed I’ve used the term “unfamiliar” market instead of “new” market. Many B2B companies call a market “new” when in fact they mean, “new to us.” This strikes me as supplier-centric—not customer-centric—thinking. The market was there first. It is the supplier that is new. This means you don’t have to live with uncertainty. Customers in these pre-existing markets are very certain about much you need to learn. 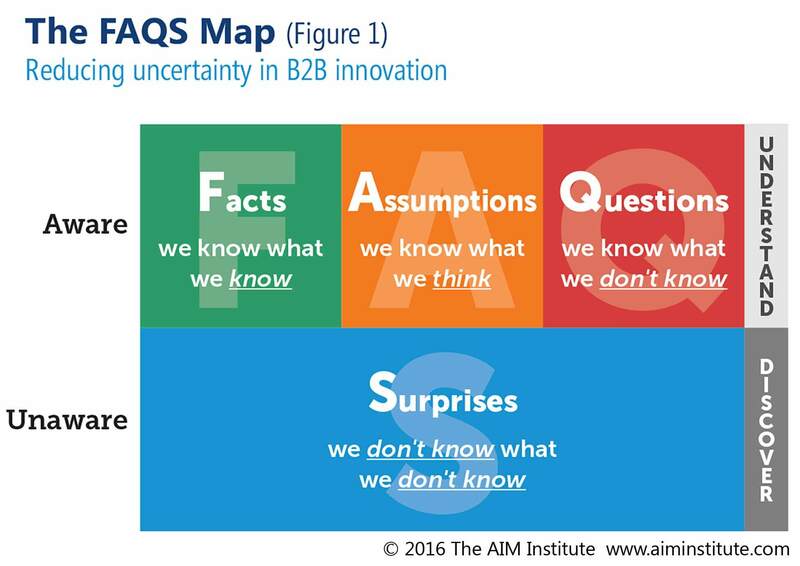 And these B2B customers—rich in knowledge, interest, objectivity and foresight—can eliminate your uncertainty. In a Discovery interview, “unfamiliar market” contacts are capable of giving you every bit as much valuable information as those in markets you’ve supplied for 30 years. Uncertainty is different than risk: Many companies fear uncertainty, associating it with risk. But risk and uncertainty are different beasts. Suppose you were asked to cross an unfamiliar chasm. Would that be risky? Hard to say. You can’t assess risk (which assigns a probability to the downside) unless you know if you’ll be facing a tightrope or a sturdy bridge. Until then, you’re simply uncertain. This isn’t just semantics. 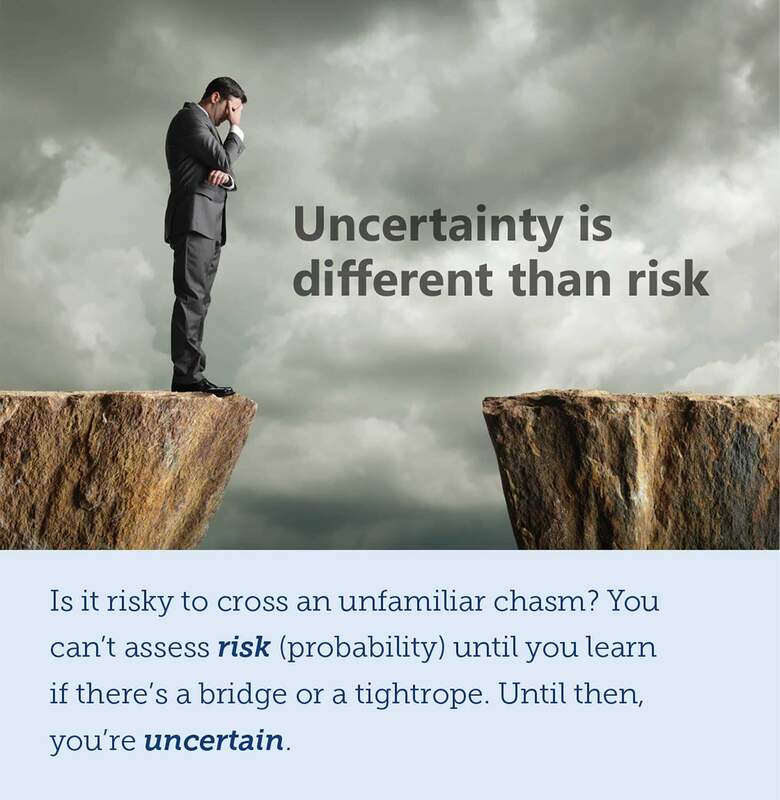 If you had a cost-efficient, structured approach to studying every chasm of interest, you’d a) know how to eliminate your uncertainty before crossing, and b) avoid undue risk, by simply opting out of chasms requiring tightropes or motorcycle ramps. This is precisely how to pursue unfamiliar markets… with a structured approach for stripping away uncertainty. You’ll no longer shun unfamiliar markets, leaving sleepy incumbent suppliers to enjoy them in peace. Instead, you’ll know how to explore them quickly and cheaply, giving you an edge most competitors lack. Of course, you could simply decide to keep focusing on your existing markets. But this often leads to incremental, not transformational innovation. A recent study examined high-performing companies, and found that 70% of their total return on investment came from transformational projects. (See white paper, Innovating in Unfamiliar Markets, page 3.) Develop skills to pursue unfamiliar markets and you’ll have unfettered innovation. It’s sad but true: New Product Blueprinting can’t solve all of life’s problems. 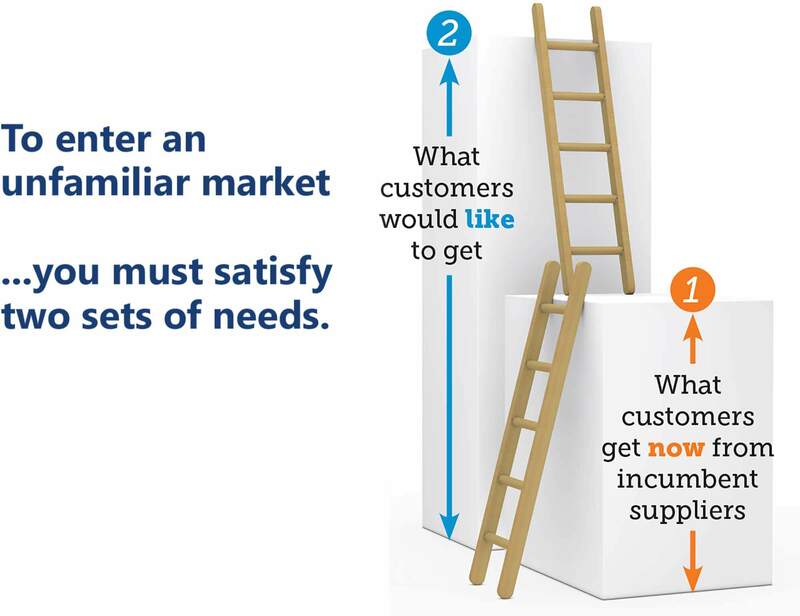 When pursuing unfamiliar markets, you need to boost your certainty in two areas: 1) what customers get now from incumbent suppliers, and 2) what they would like to get. So what do customers in an unfamiliar market get now from incumbent suppliers? These suppliers have built up many competencies over the years: strong relationships, channels-to-market, responsive technical support, warranty history, production flexibility, returned-goods systems, high product uniformity, etc. These competencies may be so expected and taken for granted that existing customers don’t even mention them during Blueprinting interviews with a challenging supplier. Discovery-Driven Planning methods uncover a broad range of assumptions to test. Figuring out how to match what customers get today is necessary, but not sufficient. As David Lloyd George said, “The most dangerous thing in the world is to leap a chasm in two jumps.” If your leap stops at matching—but not exceeding—incumbents’ offerings, why would customers buy from you? Will you drop your price? How would incumbent competitors with a great deal at stake respond to that? Indeed, you will need to offer customers much greater value than what they now receive. Here’s where your “outsider” status may help you. Incumbent suppliers often become complacent, assuming they fully understand their customers’ needs. A challenger using New Product Blueprinting methods can actually understand what B2B customers would like to get better than incumbents. 1. Identify everything you know or should know as either a Fact, Assumption or Question (using Consumption Chain and Assumption Mapping.) Your “understanding” goal will be to convert all the high-impact Assumptions and Questions into Facts. 2. Use divergent Discovery Interviews to uncover Surprises. Use all of your standard Blueprinting practices—digital projection, asking “what else,” etc.—to let prospects teach you what you didn’t know you didn’t know. Your “discovery” goal will be to convert Surprises into Facts. 3. Use these same Discovery Interviews to turn your Assumptions and Questions into Facts. To do this, use your normal Current State questions and Trigger Maps… but also have a side-list of questions you ask at appropriate points in the conversation. In our new cloud-enabled Blueprinter 5.0 software, we call these bonus questions. 4. After you have diverged to all outcomes of interest via qualitative Discovery interviews, conduct quantitative Preference interviews to develop Market Satisfaction Gaps on key outcomes. Now you’ll know precisely where to focus your innovation. With this process, you’ll know what customers are now receiving from incumbent suppliers… a huge step toward eliminating risk in unfamiliar markets. Better yet, you’ll leap-frog incumbent suppliers’ insight on what customers would like to get. Do this well and you’ll get familiar with success in unfamiliar markets. We’re certain. This is a big topic for a small article, so my apologies for just providing an overview. 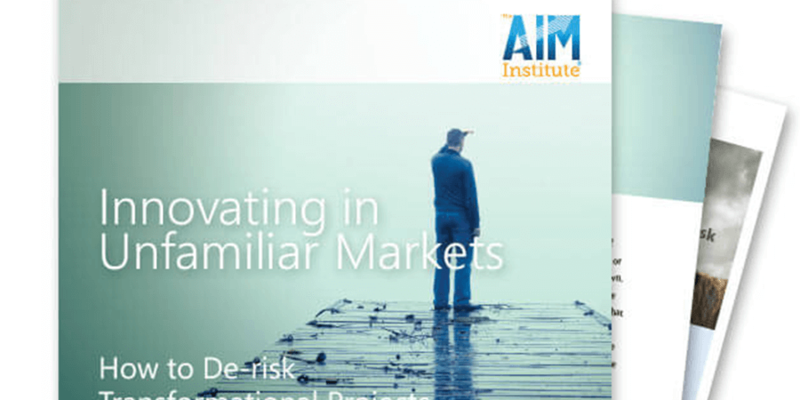 My co-authors, Alex van Putten, Ron Pierantozzi, and I invite you to read the entire white paper, Innovating in Unfamiliar Markets at AIM Whitepapers. To further explore it, join us for one of our Advanced Skills Workshops or schedule a free consultation. Also… please see our Blueprinting Training cloud-enabled software. Article excerpted from B2B Organic Growth Strategies Newsletter Jan-Feb 2016.